There may be a lot of RGB LED Drivers out there, but this one is a bit different, its versatile, small, cheap, and is simple to control. A potentiometer with built in switch is used for the controls. A quick press, switches between color cycling and solid color select modes. Pressing in on the dial and holding, toggles an Intensity control, to brighten or dim the LED. Pressing in and holding again, exits Intensity control. Settings are saved when turned on/off. 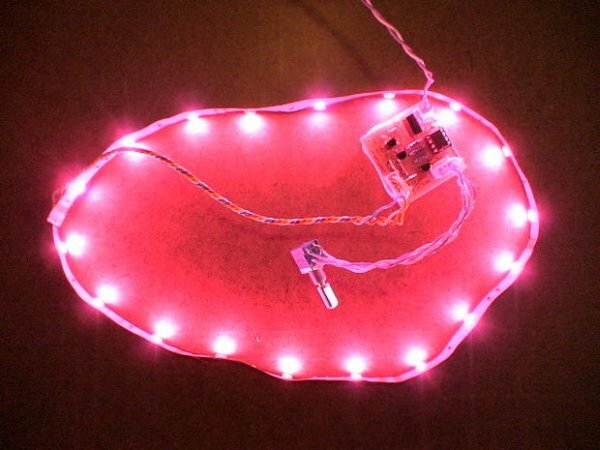 It supports common anode, common cathode, or single color LEDs. Selectable via jumper wires. 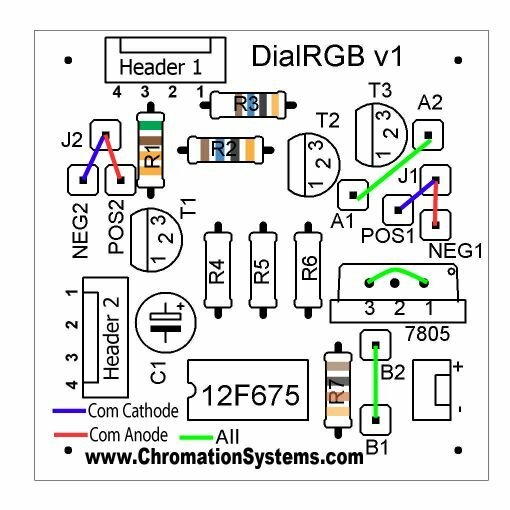 The PCB is set-up for a single 3 watt RGB LED but, it can be easily made to power a 12 volt string of LEDs in series as long as each color channel isn’t more than the recommended 2 watts ( though the transistors are rated for 2.5w ) or 500 miliamp per color channel. Correct resistor for R1, R2, R3 would have to be calculated and changed. Goto Step 7 to View. And of course best of all its free, with PCB layout, HEX file, schematics are available. Measures 1.5″ x 1.5″ x 1″ finished. All the parts you need. Just need a 5 volt @ 700ma+ Power Supply. There is an Economy Kit and Basic Kit available for this project as well. For a Cheaper Project. No Headers, potentiometer or LED, see descriptions. UPDATE 2/15/12: A new refined version has been released. It is recommended that devices are upgraded to this new firmware. Anyone who has purchased a kit, or programmed PIC can contact me for special price on a new version, or download the HEX from the ZIP file and re-program. I have included 2 modified versions of the firmware both use GP5 as a second button, one toggles the light on/off when the button is pressed, the other version holds the light on/off depending on the state of GP5, designed to work with a QT113 touch sensor. See readme for details. This Instructable will assume that the kit with a 3 watt RGB LED is being assembled. led.linear1.org/1led.wiz to find the correct resistor values you should use, or send me a PM, I will help you out. Choosing incorrect resistor values can cause damage. The author of this Instructable can not be held liable for any damage or personal loss in anyway resulting from the information in this Instructable. use at your own risk. Clear a work area, preferably with good light. Layout the parts and ensure that they are all there. – A regular Pot 1-10k ohm and a momentary Pushbutton can be substituted. *Note: these need to be small resistors, 8 mm in length. I’ve only found PR010001 that fit. though larger ones can fit, its just not pretty. – 7805 if the input voltage and LED voltage is more than 7 volts. A power supply of at least 5 volts, at least 700ma ( 1 amp is better ) is also required. Place all the Resistors First, they have no polarity so they can go in either way. Save your lead clippings for later. Placing the resistors in, and then taping them temporarily with electrical tape helps. Using some solid strand wire of at least 24 gauge, or some of the 1 watt resistors leads that were clipped,. Take a needle nose pliers, bend the wire into shape pictured below. Note: If input voltage is more than 5 volts goto Step 7 for jumper details. Place the capacitor C1. Its non-polarized so the capacitor can go in either way, even though the top-side shows polarity. Now that the jumpers, resistors and capacitor are placed. Its time for the IC socket. The socket has a notch on it that is placed as pictured on the top side illustration on the PCB, or there is reference image below. When soldering, ensure that there are no solder bridges to other pins, I recommend checking with a continuity meter ( volt meter) to be sure if some pads look to be touching. -The Transistors are placed as pictured on the topside illustration. The full kit with a 3 watt RGB LED should not use a 7805 voltage regulator. A input of 5 volts must be used. And the solder pads for the 7805 be jumped and filled. – Pin 1 & 3 are jumped ( the 2 outer holes of the 3) and the center hole’s solder pad needs to be filled in with solder. If you are using interconnects or have purchased the Full Kit. – Solder in the 2x 4 pin locking headers, they can go in either way works best. – Install the 2 pin locking header, keeping in mind the polarity. The full kit at comes with connectors to easily connect and disconnect your LED and potentiometer for easy installation into a lamp or diffusing medium. There are 3 parts, the headers, the housings and crimp terminals. Decide how long you need your LED wires and your potentiometer wires and cut the supplied twisted pair into 2 pieces, which you are going to make into 2 sets of 4 wires. Trim 1/8th” of wire off each end and follow this Short Tutorial, to attach the crimps to the wire. Slide the crimps into the housings with the tabs facing the slots, they will click when they are in. Then cut evenly in half, see 2nd image. Repeat with second set of wires. Would you also like to locate a fault within few seconds?